Day 2 and another gift for you. June Tailor’s twist n stitch ruler has 4 different cutting size options all in one ruler. Best results with a small rotary cutter to fit in the slots for the size cuts you want to make. We tried this ruler out by using some of the bella charm packs in Christmas colors. sew the charm packs into a layout of your choice. add a border before you start cutting. Line up the markings on the ruler and cut accordingly to the size you want. Today we will be giving away a June Tailor Twist ‘n Stitch ruler! Don’t be surprised if there are some charm packs in your stocking package. Make sure to leave a comment to tell us why you want Santa to leave this in YOUR stocking! The winner will be announced tomorrow morning. 2. Leave a COMMENT on the blog as to why you want Santa to bring you this Stocking Stuffer! an assortment of new MODA charm packs! If you are enjoying this event join us on FACEBOOK for more! Click here and “LIKE” us! Ooooh, what a fun quilt for a child!!! I’m addicted to charm packs! But don’t always know what to do with them. This is perfect! I NEED this in my stocking! Santa should choose me because I LOVE pinwheels and twisty blocks. They can be challenging, so I would appreciated a new way to make them. Thank you. I have been wanting to make this quilt. I really hope Santa leaves me this gift in my stocking! Would love to try out this tool to make some pinwheel table runners! I have seen these twisty blocks and have wanted to try them. This would be a wonderful fun gift in my stocking to be be able to it out on the charm packs! It is always fun to have another ruler to experiment with. i love charm packs and fun projects! I would love to have Santa put this ruler in my stocking. I see the possibility of creating some wonderful colorful quilts with this method. I would love to try the June Tailor Twist ‘n Stitch ruler. Your stocking should be filled with things that make you happy! I would love to have the ruler to start making more interesting quilts. My friend has one of these little tools and loves it. I’d be really excited to win one. Oh please, oh please…I have always wanted to do a tesselating quilt! More fun ways to be creative!! Would love to have these in my stocking! I was so hoping someone would develop a more universal twist ruler! Oh if I was being whimisical I’d wish for a baby in my stocking (my husband says we’re done at 2!) and if I am forced to be practical I’d wish for chocolate! I just need to make a simple quilt for camping. Such great colors. I love it. I think Santa agrees!! Twist and Shout!!! I would love to have my stocking full of Moda fabrics and fun. This is great! It would be so versatile. Not just Christmasy quilts but almost star like for 4th July/Labor Day, etc. This looks like fun! I like sewing with charm packs. That is an amazing trick! I used a strip cutter at my local quilt shop once and fell in love so I know how great this type of ruler is. If Santa brought me a Twish ‘n Stitch ruler for my stocking he would save me time and I’d be even more productive. Thanks Santa. I’m a follower 🙂 This would be perfect for all those orphan charm squares I have! I have actually never had a charm pack. They look so pretty, but I never had any idea what to do with them. What a nifty ruler. The June Tailor Twist ‘n Stitch ruler is one I’ve got on my wish list already. It would be wonderful to win one here and then something else could be chosen by someone getting things from my wish list. I really love the look of this pattern and how great that looks using all solids. I have tons of charm packs and this would make me use them. So i really need this in my stocking!!! you can never have too many rulers! I have never tried a ruler with grooves in it like this one. Would love to win this, the shops in France where I live don’t have anything like this. Great ruler! sure would love to try it out – I have several charm packs ready to go! A stocking with with quilting stuff is definitely a must! Oooh, looks like a very handy tool! I love the pinwheel quilt pictured above! I haven’t seen this ruler yet and I need one for my studio. I’m a complete ruler geek. I love the option of different sizes for your pinwheels. Talk about a scrap busting opportunity. This is an interesting rule and that quilt is super cute! Oh! I would love to find this in my stocking! It would be just like being a kid again on Christmas! What a cool tool! Santa can drop this ruler off his sleigh for me and I can have one tool for lots of projects!! Santa, I absolutely love this quilt, and so I need this ruler so that I can make one for myself. I promise, I’ve been a good girl! Thank you Santa! I would love to have this ruler to add to my supply of rulers that make quilting faster. I’d like to try this out too Santa and that was a good idea some-one mentioned a table runner. Nice way to try out something new! I make a Christmas quilt each year and this would be perfect! Oh I would love to have this! It would make a great quilt for my den. I love the red and green whirly giggles – I’d love to try the ruler. Santa Mama Moda, My sweet mother wants to make a twisty twirly quilt for her greatgranddaughters. Please leave this for me so can slip it into her stocking. Thank you Santa Mama Moda. Looks like a great ruler to help make such a fun quilt! Love it! I would love to try that ruler. I love charm packs and I would love to win that ruler. I don’t have anything like that and it would be fun to play with! Another cool ruler to make an awesome quilt! Would love to have this to make a quilt for new grandchild on the way! Santa Pick me!!! I love the pinwheels wheels and I love new gadgets! I will have to have that! Think of all the cute baby quilts I could make for all my Daughters friends who are expecting!!! I love it! My mom and I love to quilt. I love charm packs because I can use them for ANYTHING!!! Blankets, pillows, quilted bags. Rules are always awesome!!! Love it!!! Because all my friends have this ruler and I don’t. Love June Taylors Tools… I have the Cut and Press… this neat little cutting tool will be a nice addition. Thank you, Thank you ! Beautiful way to use up some charm packs! Love them!! I’m a gadget gal and just haven’t picked up one of these rulers yet. I love the look of the twisted patterns. Thanks! I have never tried the charm packs and another ruler would be great! Pick me, please! I am a follower of this blog of course. I am a new quilter and would love to try such a fun looking design so I would be so happy if this was in my stocking. This looks like a fun tool to use! I love pinwheels and twisted blocks like this, so would love it if Santa would leave it in my stocking! Oh Santa…I would really love to learn this! !! And charm packs…What girl can resist?? New ruler and charm packs- who wouldn’t want this? Please put my name in the hat! This looks like a great addition to my quilting rulers. Can’t wait to give it a try. Merry Christmas! Wouldn’t this make a cute Valentine quilt??? I would love to make the Twist and Switch quilt. This tool is great. Wow! Santa should pick me because I never knew how this ruler worked and now that I see it looks like so much fun! Also, I’ve been a VERY good girl, well, at least lately I have! Ha ha! I’d really like to use it! please, my name you choose it! the newest in cutting trends. To cut accurate is sooooo difficult for me. I’ m sure it would be easier if Santa gave me this great ruler. Looks like a fun way to make a quilt. Thanks for the chance. What fun I could have with that Twist and Shout ruler1 Yahoo!! I’ve never made this type of quilt. It looks like this ruler would make it really easy! I have been wanting to make a twist quit. I’d love santa to leave a gorgeous old Union Flag chair I’ve seen in my stocking, doubt it’ll fit though so I’d settle for some fabric! That is susch a bright and cheery quilt. Love it! Love working with charm packs and any notion which makes that easier. I was just at quilt camp and someone was doing one of these quilts. I would love to win the ruler so I could make one. Love the blocks! A great addition to any stocking, and would be great to usr w/ the charms cut by the Go! Very cute! I had no idea there was a ruler with that many sizes! I’ve been wanting to make a quilt using this method ever since I saw a tutorial on one of the blogs I followed during the summer. This is such a neat tool! Love that technique! Would love to win this ruler. I follow you via Google Reader – I hope that counts! I have been wanting to try this for a long, long time! Please, Santa?!? I follow you both via email and google reader. i’ve been wanting this ruler for a long time. thanks. As a new quilter, my tools are limited and would love to add this interesting one to my collection. I can’t wait to try it! I’ve been wanting to make a quilt like this but haven’t bought the ruler yet. I’d love to win it! I would love to make a fun pinwheel quilt with this awesome ruler. I am a follower of this blog. 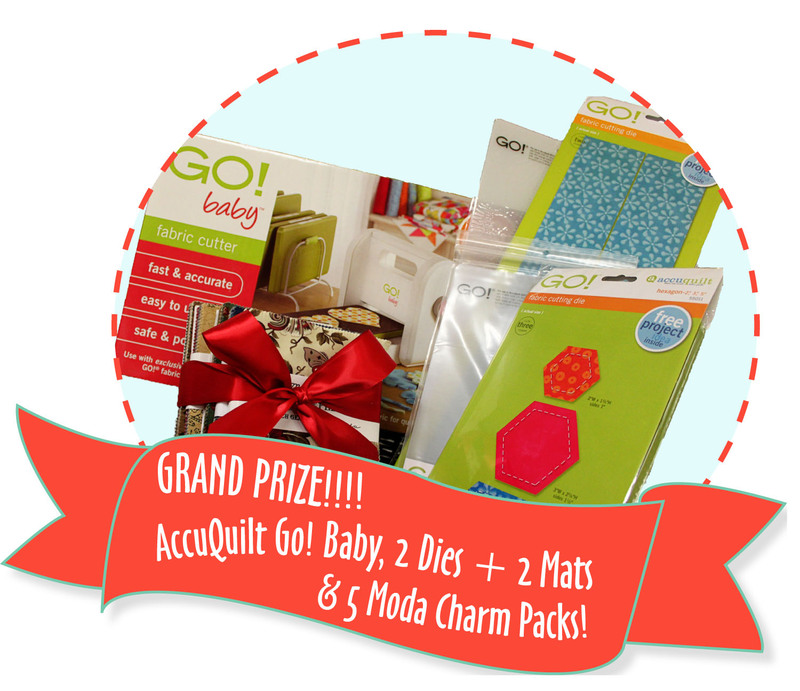 I would love to win because I love to learn new quilty things and increase my quilting knowledge. I’m pretty new to this, and always striving to learn more. This tool looks fantastic!! I’ve been wanting to try this pattern so it would be the perfect prize for me! Thanks for the chance to win it. What a versatile piece of equipment – I’d sure like to own one. It’s always fun to try a new ruler and a “new to me” technique. And who doesn’t love charm packs! I would love to learn how to use this versatile ruler. And that cute quilt pattern would be the perfect place to start. So cute and so many possibilities. What a great tool – I need to have this in my sewing room. This looks so handy! This Christmas I really want to add to my ruler / notions collection to learn how to do new things, so this would be GREAT in my stocking! 🙂 Thanks! I love how versatile this is and you can cut 4 sizes! June Taylor makes great rulers and I’m sure this would see a lot of use in my sewing room. This would be awesome yoou could have different twister sizes within the quilt. Nice! Love June Tailor rulers. Make life easy for quilters. Who doesn’t like charm packs? I want to win and I love new rulers or for that matter almost quilts! I would love to share this ruler with my DD. Thanks for the giveaway! June Tailor rulers are great. Who doesn’t like charm packs? I’m a follower. I’d love to have the new ruler – I need all the help I can get! I love finding new tools to try out. Besides that, I’ve reached a point where the rulers arranged on my closet wall look like art all on their own! Now I’m always anxious to add to the collection! I love June Tailor rulers. They are fabulous and versatile. This would make me so happy if I found it in my stocking!! I love trying new things, it would be fun to try this out with my quilt guild. We are always looking for something new. We don’t have a quilt store in the county where we live, so we bring new things to the guild when we find them. This is so much fun. I would love to make a table runner for Christmas with this ruler! The quilt is so sweet. Would love to try out this ruler! What a great ruler. It would make me look really creative without much struggle on my part. That’s my kind of quilting. I`m a follower and would like a ruler in my stocking and play with it,looks fun. Twisting with anticipation over June Tailor’s ruler and who couldn’t resist being suprised with charms? I would love to try out this ruler! And those charm packs are just icing on the Christmas cake! Looks like fun – I want one! all my cool friends are raving about this little ruler and I’d sure like to have one of my own. It would fit perfectly in my stocking — thanks! I’d love to make a Christmas pinwheel (whirlygig) quilt using this ruler….thanks! I have been wanting to try this pattern with scraps and a charm pack of solids. I would like to play with the spinning effect. Thanks! There have been so many times that I’ve almost bought this pattern. I would love to have it! That ruler looks like it would be a dream to use-LOVE the pattern!! Please Santa, I’ve been a really good girl this year! I don’t need much, just more pretty charm packs….please! I love the colors in the charm packs and would love to experiment and learn to use this ruler! I love the twisted quilts and they are certainly on my bucket list. I’d love to win this giveaway. I’m totally addicted to charm packs and all the things you can make with them. How I would love this ruler to make lots more new things, for gifts and for myself. I know I would put it to good use. what a fun gift – I have not been quilting long and spend my money on fabric – cannot afford a lot of fun gagets…. I love the amazing things that rulers can help you create! Who knew… this one is ingenious! Thank you for the opportunity to win. Have a blessed day! I am seeing more and more options on layouts for this ruler and know I could find even more excitig layouts. Awesome tool and very cute quilt. I would love one of these as I’ve been trying to work out for ages how to do a quilt like this! I love the design this ruler creates and would love to own the ruler and expand my quilting expertise! Thanks! Oh my gosh, I would love to do twisty things! I have always been afraid to cut them out and this solves the problem! would love to win this sweet package! thanx for the opportunity to do so. WOW!!! That is such a great ruler and I love using charm packs. Now I have another way to use them. That would make a great gift. Whoever invented this ruler is a GENIUS! Twist ruler has been on my wish list for several months. Add to that solid charm packs….fun!!! Thanks for the chance to win. Than winning one of the rulers! I love being able to make complicated looking designs with tools that make everything simple. I need this to make my life easier. What fun! I’m always up for tryng out a new tool. I would love to try this new ruler. Oh, I love the new tools! Such cute twisty blocks! I’d like to find this is my stocking so my sister and I can have some fun together figuring out how to do it ! I would make her do it since she thinks she can only sew squares together !!! and It would be awesome to win these beautiful charm packs ! thanks ! I’m following your blog ! i would love santa to bring this to me for sooo many reasons. 1. i’m a charm pack FREAK! love love love them! 2. i’m very perplexed with this ruler! 3. i need to learn how to create some new techniques! I would love that in my stocking, can always use more rulers. This has got to be the coolest ruler I have seen yet! I want one! Thanks so much! 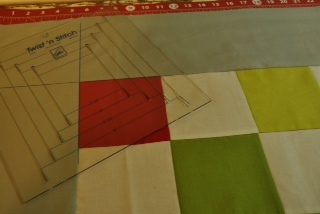 SANTA SHOULD LEAVE ME THIS LITTLE TWIST ‘N STITCH RULER SO I CAN MAKE ANOTHER CUTE QUILT! THANK YOU FOR A CHANCE TO WIN ONE! I would love to try this. It looks so easy and gives a great result. I have been pondering this type of ruler… and just got two Flora charm packs yesterday! To win would perfect timing! Would love to win this ruler. I like the looks of this quilt! I love playing with different rulers and I don’t have one of these……….the quilt looks great that that have made from the ruler………. I’ve been looking at these quilts for a while now. I think it’s great how something that looks so complicated is actual rather simple to create. Kudos to the inventer! I am a gadget girl and would love to have this ruler in my collection to make many beautiful quilts from Moda charms. Great! a ruler that does all sizes of the twister block. 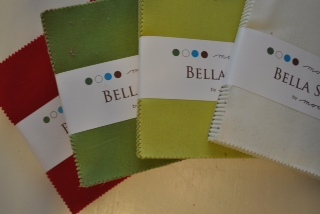 I love the new Bella solids. I have many charm packs just waiting for me to try something different with them. The ruler looks like it would be so much fun to play with! I can never have too many rulers, but the charm packs?!? Priceless prize! 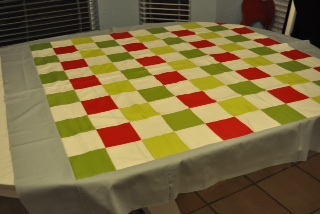 I may be the last quilter to have not made one of these Twister quilts yet:) I would love to try it out. This is a wonderful prize. The ruler looks like it would be easy to use, while the resulting top looks complicated. Good combination. I have just the perfect charm square pack to try this on!!! Woo Hoo! I would love to win this ruler for Christmas. It is one of the items on my list for Santa! I have been wanting to try this design. Would love to win the ruler. I do not have this ruler, so would be happy to find it under my tree! I really like June Tailor products. Thanks for the giveaway. Lana D.
Dynamic quilting days ahead if I get my hands on this ruler! I’ve been wanting to try this block for a long time. This would be the perfect opportunity to, if Santa left it in my stocking. I have been wanting to make one of these twister quilts for a while! So fun! I am now following you (Betsy.pratt(at)gmail.com) and would love to try out this new ruler. If I received one I would definitely start on a quilt right away. I would probably make a 2-color quilt with either light gray or white as the accent or grounding color. I love tools and I especially loooovvvvve rulers! They can be really fun to make quilts with. Love the quilt! Santa should leave the ruler & surprise in my stocking so I can get a head start on my next years Christmas gifts! I’m already a follower. Why do I want to win? So that I can make a fun TWIST and Shout quilt!!! YES, I am a follower! With this great gift in my stocking I could have endless hours of fun over the holiday period…especially if we get flooded in again. I have admired the results of this technique for a long time. If I were to win this, I would just have to try it out for myself! Thanks for the giveaway! i would love to twist and stich. if i win i am sure i will twist and shout how great this site is. Would love to have this new ruler to play with! I would love to make my gds a quilt using this ruler. I’m an email follower, but for some reason blogger won’t let me follow. i have been dying to try one of these quilts – it looks so fun and easy – but it has such a dynamic result! I love to try something new….and love those charm pack Colors. I have three grand-nieces waiting for baby quilts and could sure use this ruler! The whirlygig block has always been on my “To-Do” list, but the idea of cutting out all those individual wedges was too daunting. I would LOVE to find one of these rules in my Christmas stocking! Because I want it!!! I gotta have it!!!! Perfect for the quilts I make for Ronald McDonald House and World of Charity Stitching. Please Santa??!! 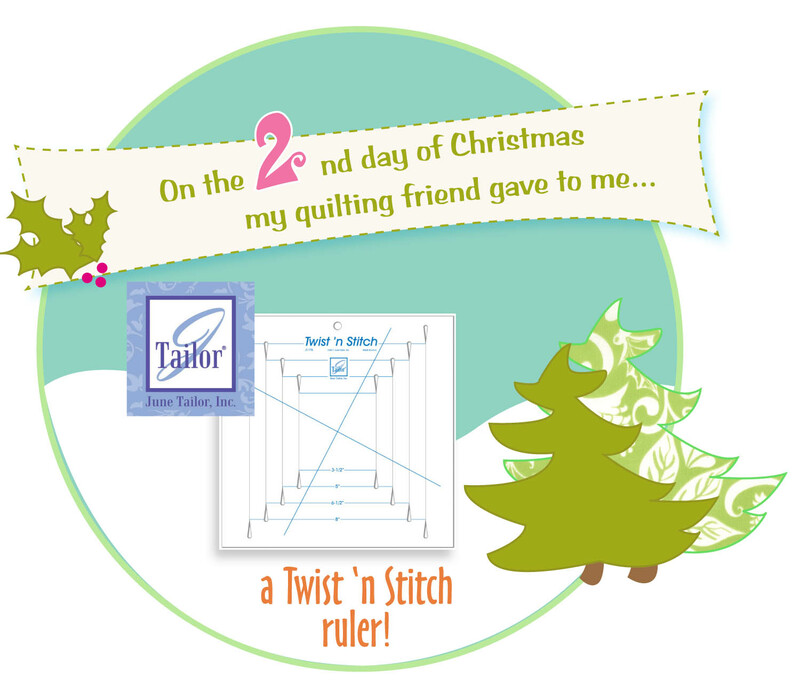 Well, I’ve been very good…and, I’m new to quilting and a 3 in 1 ruler sounds perfect. Who on earth thinks of these wonderful gadgets and rulers. They all make our quilting hobby easier. no bones about it, this twister makes for a F*U*N project!! would love to have Santa deliver it to my door! I have this ruler on my Wish List. I love challenges and I have never used this twister ruler; it should be a challenge. I have been very good–I’ve learned to machine quilt and I’m saving lots of money! Merry Christmas to Mrs. Santa. I am totally crazy for pinwheels right now and this looks the greatest tool. would love to see it in my Xmas stocking! I love the Bella solids and would love to try out the ruler as well! Been a follower for ages. I just recently made a pinwheel quilt and would love to learn to make twisty pinwheels. I just love pinwheels. Wow, so easy and so cool! I think I definitely need one! I need this! It would be perfect for a quick child’s quilt. I would love to find this ruler in my stocking. I’ve been dying to try this block after seeing some friends’ quilts! I have seen a lot of quilts with the new twist design, it would be so fun to make some of my own. Oh, I would love to win this. It is always fun to try a new ruler! I am a new follower of The Cutting Table blog! It looks like fun! I’m in! Please count me in on this one! I have several charm packs here and don’t know what to do with them. This looks like the perfect solution. Thanks! What a terrific ruler! Love the block! I love whirly gigs, pinwheeels and all that involves quilting so please put my name in the hat thanks, I follow your blog, and liked you on facebook. I have seen these twister quilts and would love to try one if Santa leaves me one. Twisty type kits can be a lot of fun (except for me to figure out just exactly what I need to do), so I would really love one of these in my stocking! I’d love to try this new ruler to make a table topper. Sometimes My blocks don’t come out to the right size and I don’t know what I am doing wrong. i would love santa to put a ruler in my stocking. This would help me tremendously. Santa needs to bring this ruler to me because I am tired of just making squares. This ruler would give them a whole new twist! I’d love to add this ruler to my quilting supplies!! I have been seeing a lot of these twist quilts. I have an older ruler that is just one size. Would be wonderful to have one that can make multi sized blocks. these wonderful templates! Great design and I’m doing my best to support Moda this weekend! I have greatly added to my stash! I am relatively new to quilting and would love to find this ruler in my stocking to add to my supply of tools. I would love to try out the ruler and the possiblity of a charm pack would be awesome. I’ve plans to make each family member a throw and this would come in handy. Great new product. 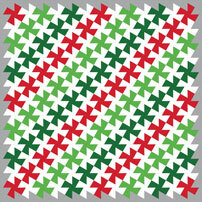 This quilt looks like “Peppermint Twist”! This is such a clever way to make the pinwheels – love the colours too! Oh, I’ve always wanted to try one of those cool rulers! I think that should be in my stocking simply because at the moment I only have 2 quilting rulers and both are basic rectangles; that looks like a fun one to have! I always love trying a new tool to create something fun! thanks! Because measuring and cutting are the most difficult part of quilting for me! This tool would really help!!! Oh Santa I’d love a new twist ruler and some lovely charm packs to make a lovely twisted quilt! I love charm packs. A special ruler to help me design with charms would be perfect. I’m a follower. Thanks for the chance to win. Wow, I would love to give that twist ruler a go. It looks like it would be a good addition to my quilting tool box. Just tuck that baby right in my stocking! oH YES!! this looks like a lot of fun! Wonderful tool…thank you! Love those pinwheels, and what a great way to use charm packs. I’d love to win! Please Santa please! I want to experiment with this fun tool! I would love to make this quilt. this ruler would be perfect!!!! Would love to “test drive” the the ruler on the charm packs. What a fun quilt! And a great way to use Charm squares. I’d love to have a Twister! This looks like something I would like to try. I have been wanting one of theses rulers. A couple of my friends have one and have made some really cute projects. Thanks for the giveaway. Love the quilts that can be made using the ruler. With 6 grandkids and more to come, that ruler would be perfect to use to make cuddle quilts. I have been looking at these and think it would be so much fun to make these quilts – something new to do!!! i want santa to leave me one so i can get over my dislike of rotary cutters and reap the benefits! This quilt has always fascinated me! I would love to have this ruler in my stocking. I would twist and shout Merry Christmas if I won this prize package!!!! I have always wanted to try one of these quilts! Please, Santa! Looks like sew much fun! Thanks for the great giveaway! I’d do the Peppermint Twist if I found those in my stocking! I love to try new rulers. Count me in. I would love Santa to stuff this ruler in my stocking – something new and unique to play with – plus it has been on my wishlist…I would love to try it out! Always looking for new ideas for all the charm packs that I seem to have all sitting pretty on a shelf. I definitely NEED this in my stocking! I love this! So cute!!!! I didn’t realize June Tailor had this ruler. Way cool. Love the charm square fabrics too. Magic tool for nice quilt ! Ooh very cool, June Tailor produces some of the best products!! I would love to try this out. Charm packs make great quilts. I have been wanting to try this ruler for quite some time now. Winning this would force me to try something new. Thanks. This has been on my want to do list for a long time! thanks – your 12 days of Christmas is fun!I am a follower! I have wanted to try this for sometime now, perfect for my stocking! What a fun quilt! I would love to see how it works. This is an interesting ruler. I love the finished twister quilts. Pinwheel blocks are a lot of fun to make, but can be “iffy”! What an easy way to make them! I’m going to look into one of these rulers! What a fabulous blog hop! Thank you! Who couldn’t use another ruler? They’re always fun! Just hoping I’m not too late. I so want an Accuquilt baby…..
Somewhere on the web, is a lovely wreath that can be made with the ruler shown today. If only I could remember where! What a super cute quilt! I have always wanted to try this tool out! I am ‘on the verge’ of making a twist quilt! So beautiful! Sorry I missed this, too. I have the original twister rulers and I LOVE them! This gadget looks fabulous. Not sure exactly how to use, but would love to try. That looks like a cool tool. I know I missed the give away but that is ok.
Not sure if we should still comment for the Grand Prize ?? but this looks like one very COOL TOOL !! This is an amazing tool! I hope santa gets me one! My heart is pitter pattering because my daughter told me about this tool and I am really hoping it is in my little stocking that I have for Xmas this year! It just looks like fun,fun,fun!!! I am enjoying all these blog posts! I have *got* to get one of these! Just bought one of these. Can’t wait to try it on some beautiful charms. I did not win this but I’m totally going to keep my eye out for that Twist N Stitch ruler. Awesome how that creates such a great looking quilt. Thank you for showing us this great must have tool. I can’t believe I missed this one! Oh well! Thanks anyway! !